Alborosie, born Alberto D'Ascola in 1977, is a reggae artist born in Marsala - Sicily, Italy, but now residing in Kingston, Jamaica. He is a multi-instrumentalist, being proficient in guitar, bass, drums and piano. His musical career began in the Italian reggae band Reggae National Tickets, from Bergamo city, when he was 15 years old in 1993, in which he was known as Stena. In 2001 Alborosie decided to try a solo career. He moved to Jamaica to be close to reggae music's roots and rastafari culture. There, he started working as sound engineer and producer. He has also worked with artists like Gentleman, Ky-Mani Marley. His first solo album was called Soul Pirate. In the summer of 2009 he released his second album which was called "Escape from Babylon. In August 2008 Alborosie played at the Uppsala Reggae Festival. 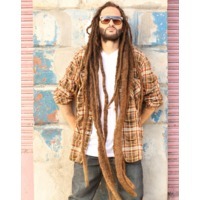 Alborosie's hits include "Rastafari Anthem", "Kingston Town", and "Call Up Jah". Alborosie recently started his own record label, Forward Recordings. He has given concerts all round the world, including most of Europe and Jamaica.